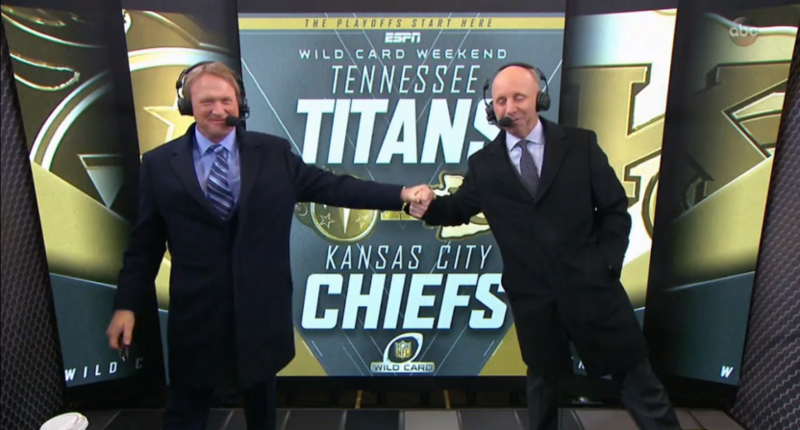 Sean McDonough doesn't seem too broken up about leaving Monday Night Football. Former ESPN Monday Night Football voice Sean McDonough appeared on WEEI’s Kirk and Callahan Thursday morning, and naturally, his time as the voice of MNF was discussed a whole lot. McDonough didn’t really hold back in his comments, stating that calling college football was “more fun” than Monday Night Football and that he felt secondary to Jon Gruden in the booth. Before discussing how he felt like Gruden was the focus of the broadcast, McDonough also preached to the choir about the godawful MNF schedule over the last couple of seasons. McDonough also says that he felt like his criticisms of the NFL likely pissed the league off, but that he didn’t think the league’s feelings towards him led to ESPN removing him from the broadcasts. The interview is a pretty interesting look into the mind of a guy who doesn’t often open up about his job and the company he works for. Last week, ESPN announced that Joe Tessitore would be replacing McDonough as the voice of Monday Night Football, alongside an analyst to be named later. Plenty of names, including Matt Hasselbeck, Peyton Manning, Greg Olsen, Louis Riddick, and Joe Thomas, have been linked to Gruden’s former job, but no decision has been made yet.